PWM performed civil engineering and surveying for this project over a period of several years. The lake was the first component in which regional stormwater detention was accomplished for a 3,700 acre drainage basin. 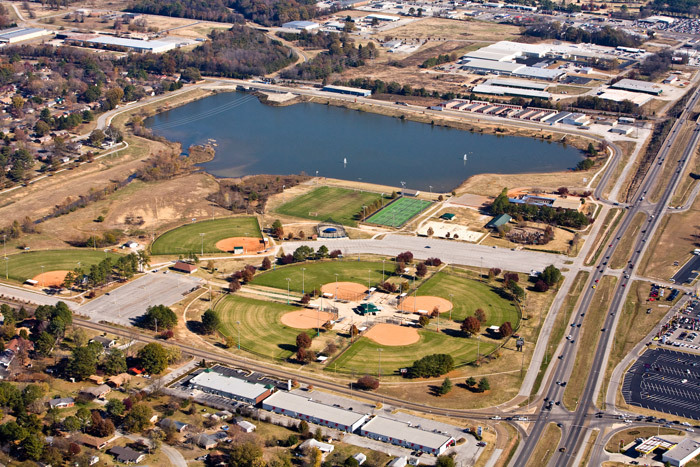 We performed master planning, surveying, and Civil Engineering for several projects including softball fields, tennis courts, parking lots, walking trails, and utilities. Our design scope included Site layout and master planning, site grading and drainage plans, roadways, design of stormwater detention facilities, site utility design, topographic mapping, and construction layout. This project required coordination with many legal entities, USACE, ADEM, City of Decatur Planning Department and Building Department.